So I thought it was only appropriate when we gathered as a family at their apartment after my brother and sister-in-law returned home with their new little life, to bring them our great-grandma’s coffee cake — my mom’s staple, her last-minute dessert, so simple and satisfying in its ease. But at the same time, I wanted to give it a new twist to celebrate the newest generation in our family. And thus was also born cardamom coffee cake. Heirloom recipes should never be discounted, never underrated. 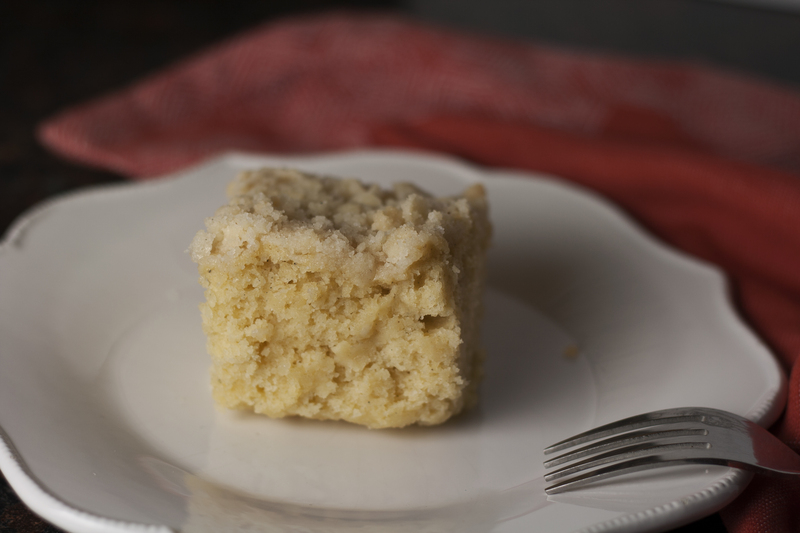 Great-grandma’s coffee cake is made with the simplest of ingredients, those we always have on hand — just flour, sugar, butter, salt, baking powder, vanilla, eggs, and milk. The texture is moist, dense. The flavor is light, ready for any fruit that may wish to accompany it, any cup of tea, any mug of coffee, any glass of milk. 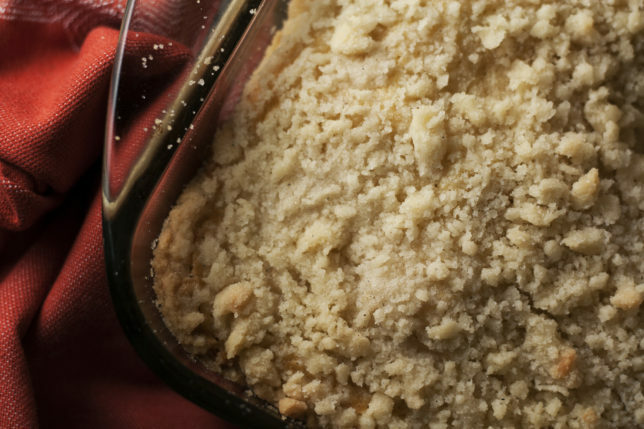 It is well-loved in my family and well-worn, despite the fact that the directions are vague — there is no baking time, no specific measurements for the crumb topping. My parents, who make it together — mom the cake, dad the topping — simply just know the way it should be. They go by sight, by feel. It has seeped into their veins to become innate, part of our family’s history, now slowly dripping into my veins until it becomes part of me as well. 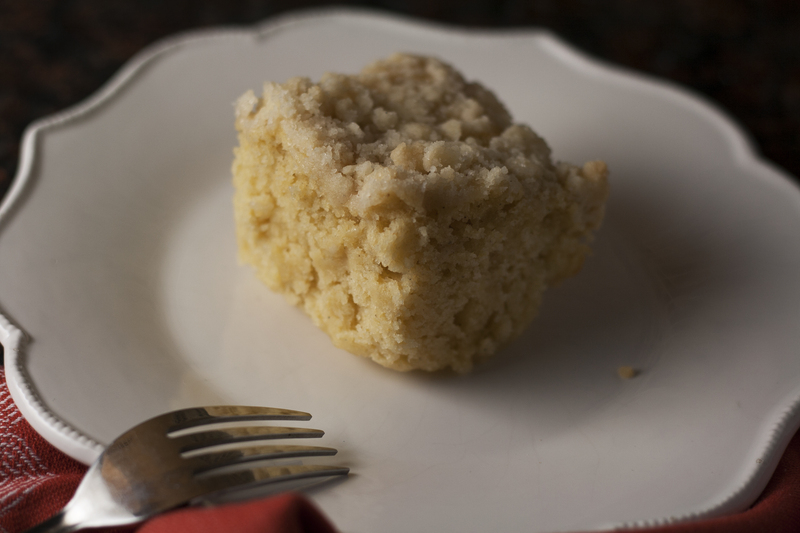 And while the cake truly needed nothing, I just loved the idea, the alliteration, of “cardamom coffee cake.” Cardamom is, generally, anything but subtle, unless it’s paired here with the vanilla and butter. 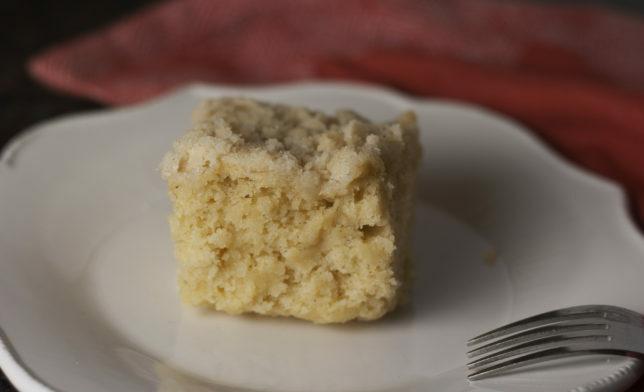 I used just a smidge — ½ teaspoon, to highlight the sweetness of the cake, and two pinches, to give a little levity to the crumb topping. It gives it a new depth, something we never even thought to look for. We didn’t eat the cake together that night. Dad had to go home, and ate a slice on his way out the door. My brother and sister-in-law were ready to pass out from exhaustion and in preparation for another long night ahead, as my mom tidied up, prepped food, and stood by to lend advice and moral support. My new little buddy was fussy that night. This bright light is so new to him — the hunger, the wonder, all these people just wanting to brush their fingers over his soft skin and smile at his beauty, this amazing new fixture in our lives. But my sister-in-law texted me the next morning. They had eaten some cake after the little man was inconsolable and they were awake in the middle of the night. The cardamom, she said, was “a winner move.” The cake helped them get through the night. These are the lines we pass on. This continuum: it’s not only a bloodline, a family history of food, of roots and flight. It’s a lifeline. It’s hard to describe exactly how the crumb topping should be. I’ve watched my dad make it a thousand times, but I still had to call to make sure I was doing it right. He always tells me that it should be like farfel — like little pebbles. The proportions may end up changing if your kitchen is dry or humid. 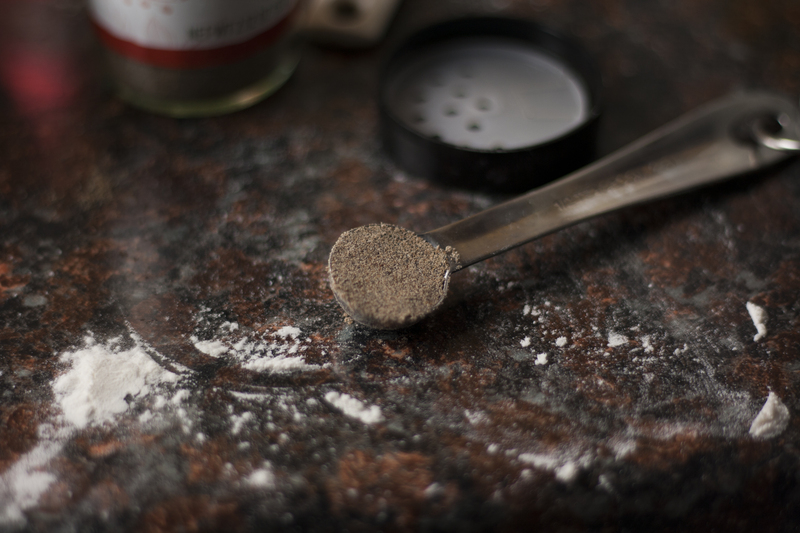 I started out with ⅓ cup of flour and added another tablespoon before it was perfect. It’s always better to have a little more flour than sugar, rather than the other way around, otherwise it may end up being too crunchy. Preheat oven to 350 degrees and grease an 8 x 8-inch baking dish. In a large bowl, cream together the butter, vanilla, and sugar. Add the eggs, flour, baking powder, salt, cardamom, and milk. 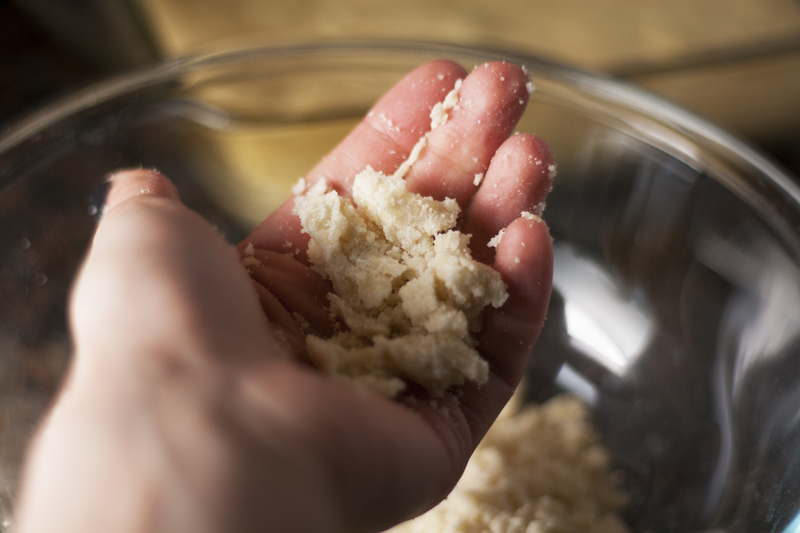 Stir together until combined — it will be a little lumpy, but make sure there aren’t giant clumps of flour. 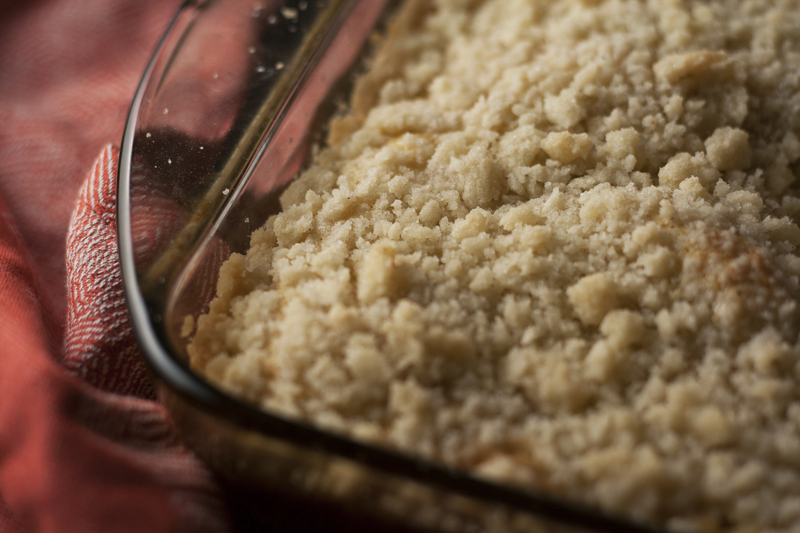 Pour into prepared baking dish and spread evenly. In a small bowl, combine the flour, sugar, butter, salt, and cardamom. Work the mixture with your hands until it becomes pebbly. It should hold together when pressed together in your hand, but there shouldn’t be any large clumps of butter on their own. It should feel fairly dry. Sprinkle the crumbs evenly over the cake. Bake for 45 to 60 minutes, until a tester inserted into the center comes out clean. Let cool to room temperature before serving.